Barcelona front-man Luis Suarez said he "feels like a footballer" after he made his Barcelona debut in a friendly against Leon on 18 August. The Uruguayan returned to football following the decision by the Court of Arbitration for Sport as to allow the striker to resume training. 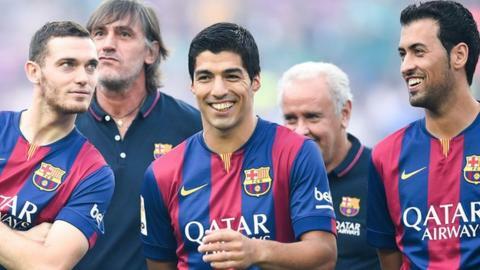 Suarez said: "I feel like a footballer, I can be with my team-mates and be with them on a day to day basis." Suarez played for the final 15 minutes against Leon in the Joan Gamper Trophy. Sporting the number nine shirt, the 27-year-old was given a rapturous reception from the Barcelona fans after he was introduced by coach Luis Enrique. Barcelona ran out 6-0 winners, with goals from Messi, Sandro, and braces from Munir El Haddadi and Neymar.